Docker Part 1: Running Containers - Don't Panic! Docker Part 1: Running Containers - Don't Panic! Docker allows you to build and run containers for applications. A container can usually be thought of as if it were a full Virtual Machine. It has most of the attributes of a VM: an IP address, a network connection and a file system. Applications can be loaded into and run from the container. However, a Docker container is not a full VM. It’s just an abstraction of the bits we’re interested in. The low level stuff in the operating system kernel is shared with the host system and with other containers. This means that containers are much lighter than full VMs. They’re quicker to start and are more memory efficient. This not only means that we can cram more containers into our available hardware, it means that containers are so cheap to run that they can be considered disposable. With Docker, we can start up a container just to run a single job and then dispose of the container when it’s done. If a service is under heavy load, we can create additional containers to service the additional requests and then dispose of them when the load settles down. With Docker, we can move away from the idea of permanent infrastructure towards the idea of infrastructure on demand. Docker is a native Linux application. The Windows / Mac OS X installations just use VirtualBox to create a Linux VM behind the scenes. I figured it would be simpler just running natively from Ubuntu. As usual, I’m using the Spanners demo app as a basis for this demonstration. This application usually runs in Tomcat 7 with a MySQL 5.6 database, both installed on my Windows workstation. Obviously, the Dockerized version will run in Linux rather than Windows but should be otherwise identical. I first considered finding a pre-built Docker image that had Java 8, Tomcat 7 and MySQL 5.6 installed and ready to go. However, this rather goes against the recommended design of a containerized stack. As the containers are lightweight, it makes sense to have each container do only one thing. So my environment design is to have a webserver container running Tomcat (with Java as a prerequisite) and a separate database container running MySQL. Many vendors – including Apache (Tomcat) and Oracle (MySQL) – offer official Docker images. That is, a container that runs their product and nothing else. I’ve chosen to run the official Tomcat 7 (with Open JDK 8) and MySQL 5.6 images. Note that the command was run with sudo. The docker command requires root privileges so you must either login as root or run all commands with sudo. This command tells docker to execute a command against the spanners-database container. In this case, the command is to have mysql run the initialize_db.sql script. This script sets up the spanners schema and creates a user for the webserver to connect. The --link switch is to link this container to the existing spanners-database container. This essentially creates a network connection between the two containers and allows the webserver to communicate with the database. The -p switch opens up a connection to a port in the new container. Port 8080 on the container will be served as port 8080 on the host machine. 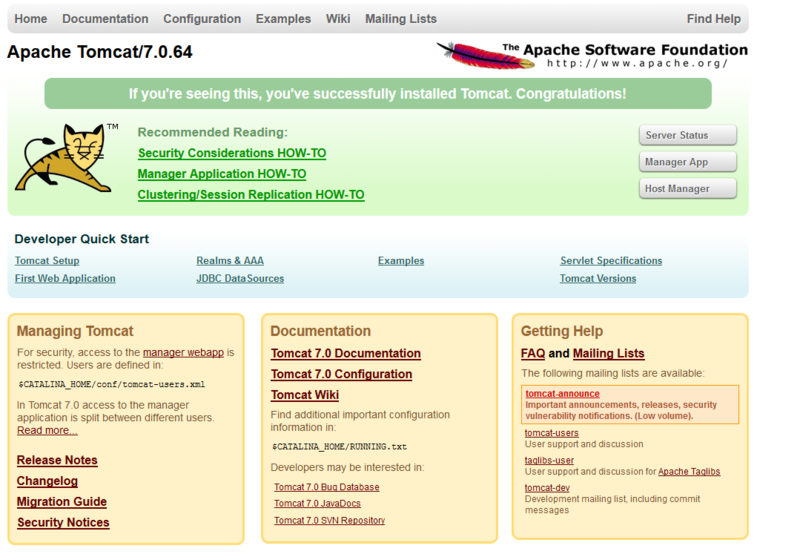 This allows us to access the running Tomcat instance at http://localhost:8080. Again -d signifies that we’re running detached, not interactively. This is a fresh instance of Tomcat with no configuration settings changed and no applications deployed. We need to copy the necessary config files and database driver for the Spanners app. This is done using the docker cp command which copies files from the host system into the container. We’ve used Docker to run an instance of MySQL and an instance of Tomcat. We’ve then manually configured these instances to run our application. Using Docker in this way does not offer much advantage over simply installing MySQL and Tomcat to the host machine. Docker’s power comes from the ability to modify container definitions (images) so that they start already configured exactly the way we want. In the next article in this series, we’ll look at building Docker containers from our own customized images and how this simplifies our set-up work. Posted on September 26, 2015 by Stuart Leitch. This entry was posted in Docker, How To and tagged container, docker, Docker Hub, image, linux, MySQL, tomcat, virtual machine, VM. Bookmark the permalink. Nice article. Thanks fr sharing. Looking forward to the next article of this serie. Pingback: Docker Part 2: Building Images « Don't Panic! Pingback: Docker Part 4: Composing an Environment Stack « Don't Panic! Hello, great subject and clear article, thanks! Just a question for you: where can I get the context.xml, the tomcat-users.xml and the .jar to copy them into the container? 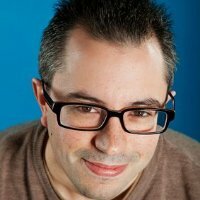 Hi Francesco, thanks for your question! All the files required to run this tutorial are now on my GitHub repo (link is to latest version). The specific versions used for this tutorial were tagged as version 3.2 (this link will always work). The specific files you asked about are in the spanners-webserver/tomcat directory. If you skip ahead to Part 2 of this tutorial, you’ll see a way that you can run this from a pre-built image with the necessary .xml and .jar files already in the container. Good luck! Can you please help ??? I’d suggest that you check that you’ve run this command from the right directory. You should be in the spanners directory which should contain subdirectories spanners-dao and spanners-mvc. Where can I find the spanners directory? I searched your GitHub projects but I can’t find spanners directory which contains subdirectories spanners-dao and spanners-mvc. When I downloaded the code from your GitHub. Should I manually add these two lines? However, if you look ahead to part 2, I ended up creating a new image extending mysql:5.6. I used the MYSQL_DATABASE and MYSQL_USER environment variables to take care of this. That’s the code now in GitHub. So you have a choice. Either add the two lines to the initialize_db.sql script or set the MYSQL_DATABASE and MYSQL_USER environment variables.